My dog, Lily, is spoiled. I know, no one is surprised. (P.S. Lily has a post all of her own tomorrow – be sure to check it out!). Yesterday, Lily and I went on a mommy-daughter “field trip” to PetsMart (we referred to this as “Operation Get Away From Sick Daddy”). She got 2 new “babies” (this is what we call toys…who knows why), 3 bones, and a new chicken-flavored Nylabone. She loves it — she even sleeps with it tucked under her paw. Anyways, that trip to PetsMart ran me $31. Oops. Now what if I told you that’s more than I spent on GROCERIES for 2 people, for an entire week? Believe it. The best and easiest way to cut costs at the grocery store? I generally buy my chicken from Trader Joe’s for $2.99/lb, but TJ’s is about 20 miles from my house. With the price of gas (!! ), I haven’t been able to justify making that trip. I’ve also opted to make a concerted effort to include recipes that use really cheap proteins, like lentils. Admittedly, lentils don’t make me swoon. To me, they can lack flavor and the texture can be a bit…grainy. But after RAVE reviews from my friend Kristen about these tacos, I knew I wanted to give them a try. These lentils were seasoned perfectly and the texture was similar enough to meat, that even a meat-lover may get stooped with these (even with all 17.6 grams of fiber!)! 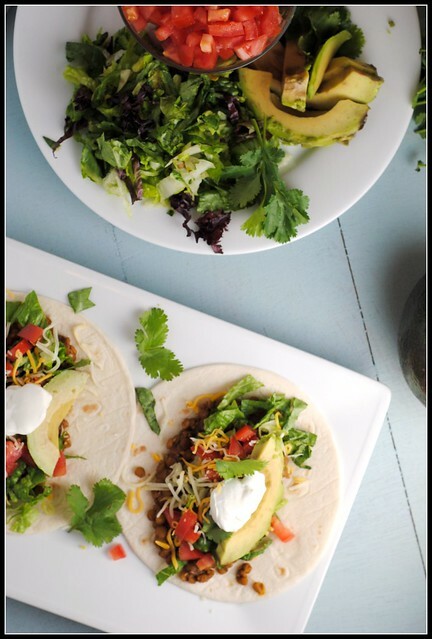 Tacos are packed with flavor, and many different flavors at that, making them the perfect vehicle to not only try a new protein, but to experiment with new flavors and ingredients…even with picky, unadventurous eaters! I also loved that this meal was ready in 30 minutes. While the lentils simmer away, you can prep all the other ingredients. 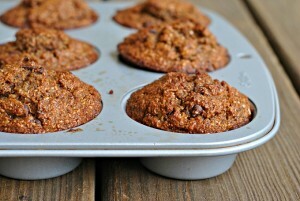 These reheat great and are very inexpensive. In a nonstick sauce pan, heat oil until hot. Add onion and garlic and saute until tender. Add the lentils, chili powder, cumin, and oregano; cook and stir for 1 minute. Add broth; bring to a boil. Reduce heat; cover and simmer for 25-30 minutes or until the lentils are tender. Uncover; cook for 6-8 minutes or until mixture is thickened. Mash lentils slightly. 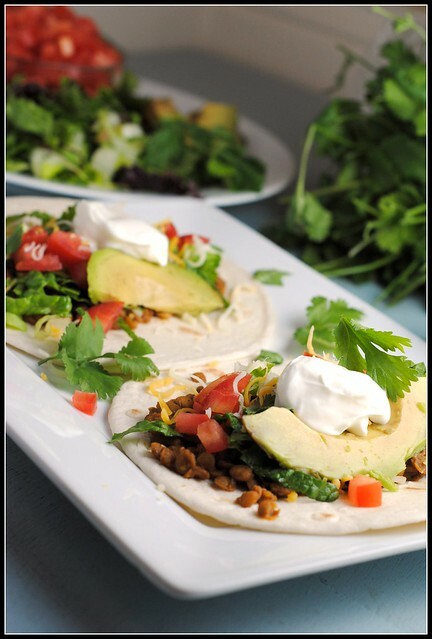 To make the tacos, layer a scant 1/4 cup lentils into each of 8 tortillas. Top with a pinch of lettuce, spoonful of tomato, avocado slice, and 1 tablespoon of cheese, salsa, and Greek yogurt. Result: I love tacos, and these totally hit the spot. The lentils are the right texture to mimic meat and they’re seasoned so perfectly that you won’t miss meat for a second. Despite my skepticism, I do believe these were one of my favorite meals in a while – delicious! And simple! Because you can prep everything while the lentils simmer, this is a weekday meal that can be ready right at 30 minutes. Enjoy! Money Matters: The most expensive ingredients is the salsa ($1.20), lentils ($1.19), avocado ($1), tortillas ($1.69 for 10) and the Greek yogurt ($1). Half an onion is ~$0.60, tomato ~$0.30, and lettuce ~$0.60. The total cost of the recipe comes to $8.71 and the cost per serving: $1.74. My weekly menu is late this week…but that’s because I couldn’t decide on what to make! P.S. Here is the round-up to all of the gorgeous Cuban and Filipino dishes made for Krystal and Baby Cookie! We do always have lentils on hand…This week I’m using them for a salad. I am glad you liked the recipe! I loved it as well – tasted very similar to meat tacos to me! The leftover filling tastes great on a salad as well – that is how I used my leftovers! these look amazing! I LOVE this idea! 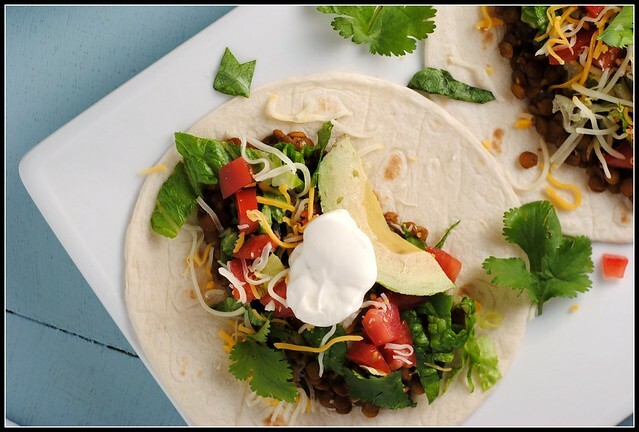 I love lentil tacos and these look delicious. But your photos?! GORGEOUS! Nice work! What a neat idea! We are trying to do do meatless once a week so this just seems perfect for us. I’m not a huge fan of lentils either, so I’m curious to try this! I hope you like the Green Chile Enchiladas! 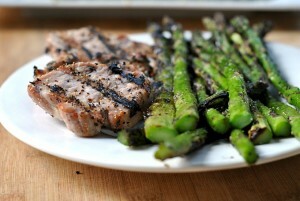 While I didn’t necessarily stop eating meat to cut costs…it’s a definite plus! Also, with delicious meals like this, who needs meat anyway. These sound awesome. Totally PINNED. I am so impressed by your grocery bill!!! Wow, I need to take a lesson from you, lol! I’m a real meatless meal-lover, but Mike is such a carnivore. 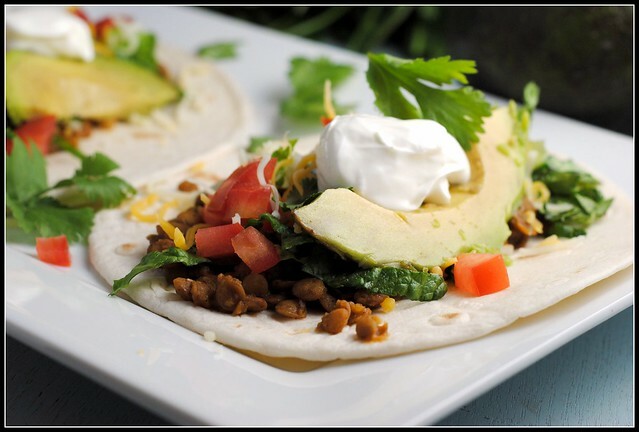 He does love lentils though, so I think he’d definitely enjoy these yummy tacos! I love lentils. I always have them in my cupboard, but I don’t use them nearly enough. These tacos sound fantastic. As for the petsmart situation, I’m lucky if I can get out of there for less than $30. Lexie gets so excited when I come home holding a bag (from anywhere) so when I actually get stuff for her, I go a little overboard because her reaction is so cute. Mmmm, a fantastic and inexpensive meal. I’m kinda jealous that you spent less than $31 in groceries. I’m kinda excited for tomorrow’s Lily post…you know I love seeing that lovable dog of yours!!! You spent $31 on groceries for the week?!?!? THAT I am blown away by! I’ve definitely be loving more meat lately…. Yummy for me (plus it’s keeping all my #s good! ), but not so good on our wallets. Yummy! We definitely go meat free most of the time for the savings. The difference is pretty incredible, and most of the time I never feel like I’m missing anything(OK, I never do, my hubby sometimes does, haha). The spices on the lentils sound delicious! These look fantastic!! 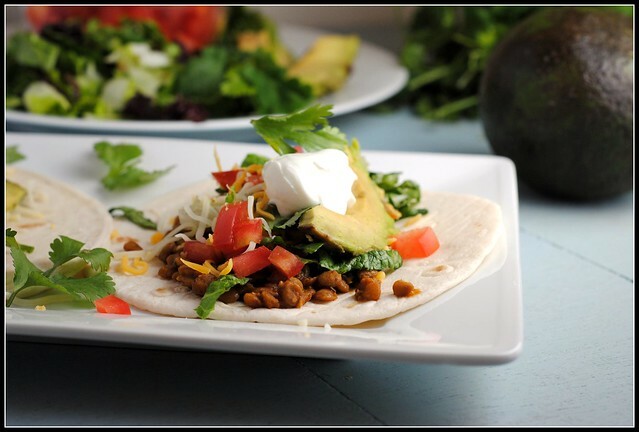 I’ve been looking for a vegan taco option, and these will be easy to vegan-ize. Also, I love that you provide the nutrition info, very good to know. Thank you! Oooh, I’ve made lentil tacos before. The photos are lovely! Yay!! If that isn’t a testimony to lentil taco awesomeness, then I dunno what is! Thanks, Corey! Have a super weekend! Love the vegetarian take on tacos…never thought of that. Thanks for the inspiration! I’ve wanting to try lentils instead of meat in tacos. I’m glad I found this recipe. Made these for dinner tonight. My meat loving husband scoffed at the idea, but after trying them said they tasted beefy but better than ground beef. He said we could eat these instead of beef from now on! Thanks for the great recipe! These were amazing!! I love lentils but my carnivore DH cringes at the mere mention of the word. To my surprise he LOVED this dish. Everything just tasted so fresh, a perfect combo. I will certainly keep this recipe for future use! Bonus – leftovers were just as fantastic!